Experience a great day on the water. 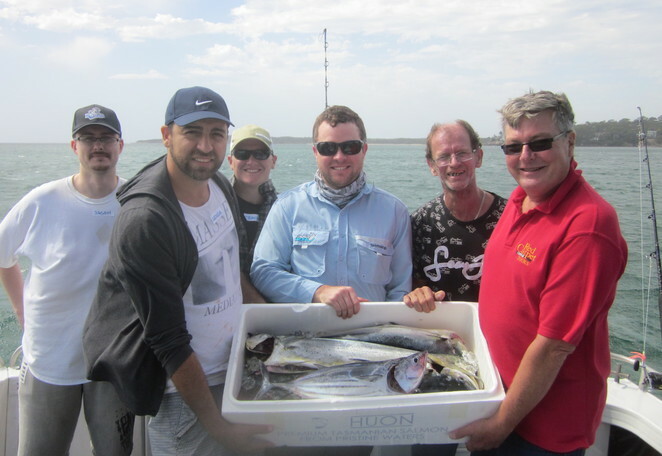 Throughout Sydney, there are a number of charter boat operators that will take you out off Sydney to chase the myriad of fish species that can be found not that far offshore from Palm Beach in the north to Stanwell Beach in the south. 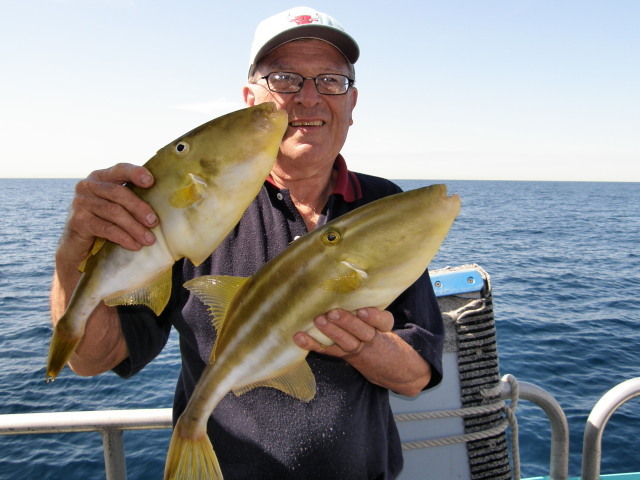 Ian Davison is a deck hand on All at Sea Charters. 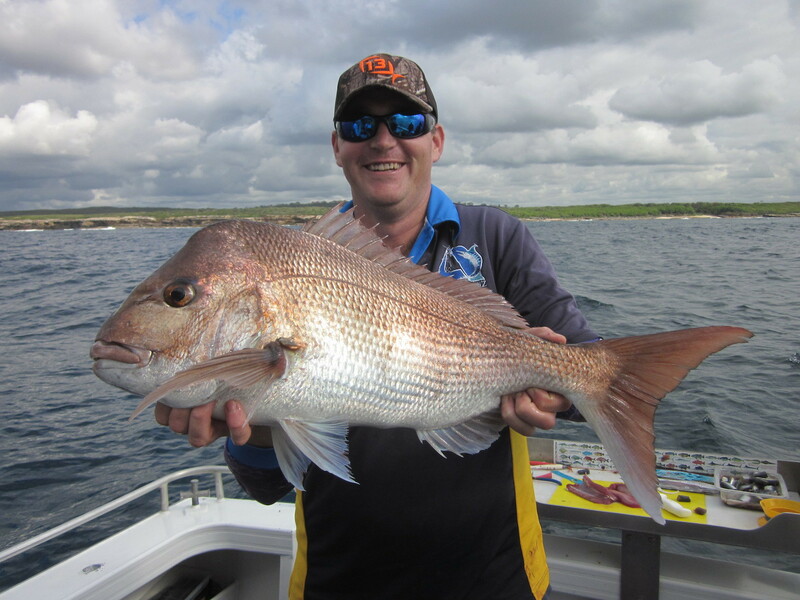 He caught this 5.4 kg snapper while using soft plastics at Fish Reef. Photo courtesy of All At Sea Charters. Some of them are what I refer to as bottom bouncers. Not that there is anything wrong with that type of fishing as these boats will take you out to their local reefs, gravel patches or sand areas, where you will drop what is call a paternoster rig (see drawing) to the bottom and drift over a number of times. Paternoster rig for bottom bouncing. Chinaman leatherjackets are commonly caught while botton bashing. Photo courtesy of All At Sea Charters. Now as I said earlier, there is nothing wrong with this type of fishing as it produces snapper, morwong, leatherjackets, trevally, kingfish, tuna and flathead - all of which are great to eat. Other charter operators will set a few lines out the back and troll for kingfish, tuna, dolphin fish and marlin with game rods. This too is a great way of fishing. Then there are others who will go out and find a reef somewhere and anchor up, lay out a berley trail and fish the area around the boat for whatever they can attract to the back of the boat. Once again, this is a great way of fishing. Are there some of these charter boats that have the expertise to be able to do all three styles of fishing. Yes, there are! But what about a person who doesn't know much about the Fishing Charters that operate out of Sydney - they'll usually just 'google' 'fishing charters' and hope that the one they are after comes up in the search. Over the years that I have been fishing I have been out on a number of different charters boats and believe me, there are some out there that you wouldn't touch with a ten foot pole. But on the other hand, there are some great ones that operate off Sydney. One that comes to mind is All At Sea Charters that is based in the Port Hacking on the southern side of Sydney. Roland Persson has run and operated All At Sea Charters since 2002, with the help of a number of deckhands over the years. A couple that comes to mind are Craig Ingram (who has been with Roland since 2002) and Ian Davison (4 years) who also works for Fergo's Tackle World at Taren Point. All aboard at All At Sea Charters. It was with this in mind that I organised a morning out south of the entrance to the Port Hacking River to chase bonito, kingfish, snapper and morwong. Roland and Ian met the group at our normal departure point, which is the public wharf in Gunnamatta bay, just down from Cronulla railway station and off Tonkin Street where free parking is available next to the boat ramp at Tonkin Park. Alternatively look for parking around the railway station and walk down to the marina and wharf through a tunnel under the railway track. After a few quick introductions, we headed off and as soon as we cleared the channel at Gunnamatta Bay, Ian was deploying the trolling lines out the back. One with a small skirted lure, one with a shallow running minnow and a smaller trembler. On the way down to what is called "Fish Reef" we managed to troll up six small bonito. Personally I class bonito as a great bait for bream, snapper, trevally and flathead, but these fish were destined for the pan as there were bleed and put straight on ice. Not bad after a 3 way hook-up on bonito. There were five of us fishing on board and all of us were not using any type of bait at all. We were either using soft plastics on 3/8th to 5/8th oz jig heads and micro jigs. Even though the bite was a bit slow we managed to jig up bonito, kingfish and one large red rock cod. That's one hell of a red rock cod on a Gulp soft plastic. On other outings that I have been out with Roland we have managed to get Australian salmon, tailor, kingfish, snapper, morwong, leatherjackets, silver trevally, dolphin fish and tarwhine. WHAT DOES ALL AT SEA CHARTERS OFFER. They leave the wharf at Tonkin Street in Gunnamatta Bay at 7:00 am and return at 12:00 pm. On some occasions we may also do an afternoon event, leaving port at 12.30 pm and returning at 17.30 pm. They accept group bookings, but also individual reservations and make up suitable teams as required. Of course, if you arrange a team, they can make adjustments as necessary to all schedules. You too could take home a feed of fish like this one. Photo courtesy of All At Sea Charters. They leave the wharf at Tonkin Street in Gunnamatta Bay/Port Hacking at 6:30 am and return not before 1.30 pm. This is a seven hour day (it could be longer if the conditions are good and the fish are biting!) where they may start the day by catching fresh baitfish like yellowtail or mackerel, then head out to the Continental Shelf, about 15 nautical miles (25 kilometres) east of Sydney's coastline. They often apply a variety of techniques such as trolling live baits or lures as well as cubing or sending down bait fish deep. Depending on the sea conditions and season, they may also go to some off-shore reefs for bottom fishing as well as trolling the coastline for pelagic species. Check out the smile on this guys face after he landed this Mahi Mahi. Photo courtesy of All At Sea Charters. Mahi Mahi will hand around Fish Attracting Devices (FAD). Photo courtesy of All At Sea Charters. As with the other trip options, we take group bookings but also individual reservations and make up a suitable team for the day. We have coffee or tea when we meet for a briefing, followed by mid-morning breakfast. Soft drinks plus a light lunch with ham, cheese salad and fresh bread rolls are included as well as afternoon snacks. They can take you cruising or reef fishing for $250 per hour, with a minimum of three hours and up to 7 people. They can accommodate your specific requests but normally cruise Port Hacking, visiting interesting locations like the various bays, The Royal National Park or swimming at some wonderful and safe beaches. If you don't like fishing you could always take a cruise on All At Sea Charters. Maybe New Years Eve to watch the fireworks. Photo courtesy of All At Sea Charters. Experience the wonderful sights of whales, dolphins and sea birds out wide offshore. Please call for up-to-date sightings and recent experiences. As the whales migrate north close to the coast, the cost is $150 per person, including morning tea, coffee, tea and soft drinks. (At the time of writing). The cost is $150 per person and trip duration is five hours. (At the time of writing). To help you out for when you have booked a morning/day out on All At Sea Charters with Roland and his crew, I (with the help of Roland) put together a few question and answers that will help you day go smoothly. A. A jacket – even a nice day can turn cold with the wind factor. A. Sea sickness remedies, if needed. You will need to take at least one hour before the trip. Many brands are available, as always consult your physician to make sure the medication is right for you. A. Non marking sole shoes that won't slip on deck, and remember they might get wet! A. Protect yourself against the sun. The reflection of the sun off the water tends to triple the amount of sun compared to a day on land. Wear, a hat and sunscreen and sunglasses. Q. What fishing gear is supplied? A. Rod and reel outfits for trolling and bottom bouncing, plus some light spin gear. All terminal tackle and trolling lures. Roland has a great selection of rods reels and lures to cater for your every needs. Q. What bait is supplied? A. Prawns, squid and pilchards, plus if you catch some bonito, pike, tuna, etc that you can use a strip baits. Or, if you like you can bring your own bait. Bonito either make great bait or you can eat them. This one was trolled up on a plastic skirt. Q. I would like to show family and friends photos or video from the trip. How can that be arranged? A. As a complimentary service we may take digital photos and e-mail them to you the day after your trip. Just remember to give us your e-mail address. Alternatively, bring your own camera and video equipment. Ask the captain for dry storage on the boat for such water sensitive equipment. Q. I sometimes like some refreshment during the day. Is beer available onboard? A. No, alcohol is not available onboard. This is a dry boat, with the exception that alcohol may be brought onboard if consumed in moderation, responsibly and towards the end of the trip. Q. Is smoking allowed onboard? A. Smoking is discouraged. If desired, please bring a container for ash and cigarette butts and position yourself away from the cabin and rear deck. This is provided sea conditions permit. Q. I would like to bring my own fishing gear. Is that OK? A. Yes, no problem, as long as you know your own equipment and its capabilities. Alternatively, use our rods and reels. Just treat the captain's equipment and boat with care and you will have a pleasurable trip with none of the responsibility and clean up. Q. Can I take home a feed of fish? A. Yes, you can. 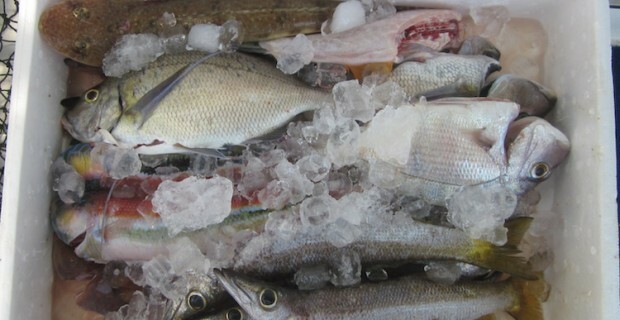 All the fish caught are gilled and gutted and put on ice ready for you to take home. You are supplied with a plastic bag for the fish, so it would be good to have an esky in the car for the trip home. All fish caught are kept on ice for you to take home. Photo courtesy of All At Sea Charters. All At Sea Charters is a well established Australian business providing services on a 34' fly bridge cruiser with excellent facilities and is equipped with all the required safety equipment and is compliant with NSW Maritime safety standards. All the fishing gear is supplied or you can bring your own. All rods, reels and bait are provided during your trip and the crew will provide fishing advice and tuition, if required. All At Sea Charters has a fishing license which covers everyone on the boat. There is a range of quality Shimano equipment ranging from light spinning gear to Charter Special overhead reels and 24 kilo game fishing rods and reels. A GPS and Koden sounder helps locate seabed structures and allows you to return to particular fishing hot spots. Coffee, tea, biscuits and soft drinks are included and also mid-morning snack. It's always great to get feedback from anything that we do in life, and sure some of bad (constructive criticism), but most of it, you hope is good. I've put together a few of the testimonials from his happy customers. This is what Roland loves to see. Happy customers. 2. Hi Roland, A huge thank-you to you and Craig for one of the best days of fishing I have ever had! The charter was just perfect and the company was fantastic. What a great bunch of guys! We cooked the fish last night and they tasted amazing. The tuna was good but the Mahi Mahi was exceptional! (Sprinkled with herbs, drizzled in olive oil, wrapped in tin-foil and cooked on the BBQ! Just melted in the mouth!!!) Thanks again... you blokes run the best charter in Sydney by a long way! Cheers, Andrew. 3. Hi Roland, Personally I have never seen so many Dolphins in one place, not to mention a large seal, then a Humpback Whale with her Calf and finally a small Shark!!!! What other Fishing Charter provides the big four sightings plus good company and very skilled Captain and Deckie. "All at Sea" for me!!! "I'll be back"!!! Thanks for a great mornings fishing - Stan Blayney. A yellowtailed kingfish that was caught on a Gulp Nemsis. Another 2 way hook up while trolling. In summing up, as stated earlier in this article there are a number of charter boats that operate out of Sydney and they do a variety of things. What you get from Roland and his crew at All At Sea Charters is the complete package; 50 combined years of fishing knowledge, a great boat to fish out of, plenty of quality fishing gear, a crew that will work their butts off, a friendly smile and last, but by no means least; they will get you onto fish. Why? Great day out on the water. Cost: Various. Refer to article for cost.